The flooring in the house was either old, musty green carpet or poorly installed linoleum. We knew right away that both would have to be removed and replaced. Unfortunately, when we pulled up the existing flooring and pried up the subfloor, we found that the original floors had be painted, caked in glue and each subfloor panel was full of so many nails, it ripped the flooring apart to pull it up. I was so bummed and began to look into other flooring options. This flooring doesn’t look so bad, but it’s a single vinyl sheet that was poorly installed and was already beginning to flake and peel. I really wanted real hardwood floors but most of the ones that I liked were $4-$5 a sq foot and that just seemed unattainable with our budget. Most of the laminate options didn’t appeal to me or still seemed expensive. Then I stumbled upon this idea to use Pine 1x6’s to create beautiful floors. There are a million different ways to go about this, I read so many blogs, reviews and ideas before we settled upon the strategy we used. So while I will be sharing the way we did our floors, be aware that there are so many other ways to do it! If you’re interested in this type of project, do your research and decide what will work best for your time/space/budget! 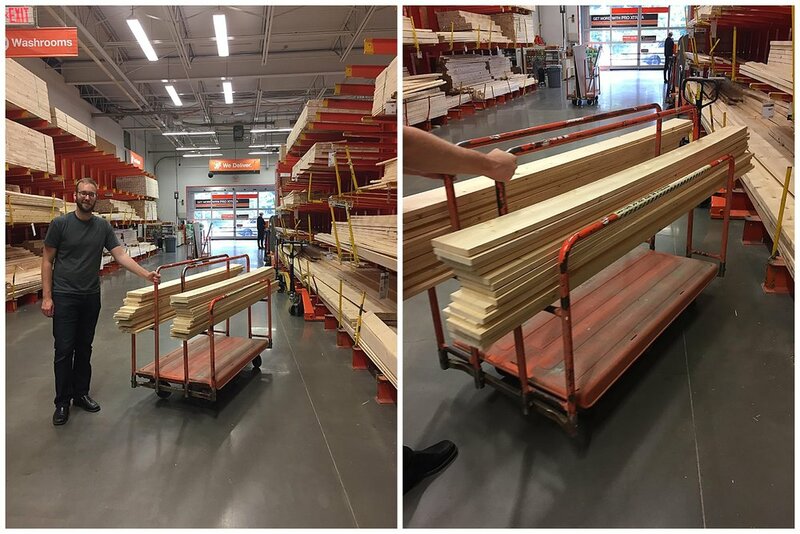 We looked around and found the cheapest place to buy 8 foot 1x6s was Home Depot. Because we live minutes from the Canadian border, we could cross the border into Canada and buy them there. Not only is lumber cheaper in Canada, but the exchange works in our favor. Each 1x6 cost us $4.74 USD. Choosing the boards was one of the most annoying parts of the process, but really important. We tried to choose boards that were straight, didn’t have huge chips or chunks broken off and that weren’t full of huge knots. We bought about 50 boards at a time (keep in mind, we hauled everything in our mini van, so we were a bit limited to begin with) to avoid leaving lumber to sit for too long before we used it. We were lucky that our house had great subfloors to work with, it was clean and level. We did very little to prepare it for laying the floors down. I started in one corner of the room and simple started by laying down an 8 ft 1x6. Laying the boards down was rewarding and pretty quick - or as quick as can be expected when you consider I was working by myself with all three kids around. I set up the chop saw in the backyard and after many trips in and out of the house, the floor was mostly laid down. Some people installed the floors with a small gap between the pieces. We decided to get them in as tight as we possibly could, knowing they would likely shrink and we’d end up with gaps anyway. The hardest part was when I got to the end of the room and had a couple really odd shaped and spaced places left. I used the jigsaw to cut the 1x6 the shape that I needed and then hoped and prayed that the baseboards would hide my messy cuts! I wouldn’t even attempt this project without a nail gun. After we dry fit all the boards, I crawled along and put a million nails in each board. This was rewarding work because it evened out any bowing or bumps. I made sure to shove the boards as tight as I could before nailing them into place. The nails are not visible which I also liked! After everything was securely nailed into place, I used the palm sander to try to get some of the rougher areas cleaned up before we rented the big sander. Honestly, I’m not sure if this step was necessary or not. When we did our bedroom (the first room we did) we weren’t as careful about choosing lumber. We found that there were some areas that were really too rough to smooth our no matter how much sanding we did. 6 months later, I don’t notice these areas at all, but I would still prefer they weren’t there. Going forward, we chose boards more carefully and the sanding step was much easier. We rented a big sander from the hardware store down the street. The smallest time increment we could rent for was 4 hours and we found that was plenty of time. The sanding step was quick and rewarding! We used a ShopVac as we went along to control the dust and make sure we wouldn’t be sealing dust into the cracks of the floor. When we were done the floors were smooth and ready for stain! The stain we used was “Early American” by Varathane. I spent a long time trying to find the perfect color stain, I wanted something darker, not orange or gray tinged and not too light. Months later, I’m still really happy with this color! I love the true brown color and it went on really well! It was nice to have two of us applying the stain, one went ahead with a heavily loaded brush and dripped stain into all the cracks while the other used a stain brush (almost like a swiffer) and spread it all out. We found the stain didn’t always make it into the cracks otherwise and we’d end up with light areas. 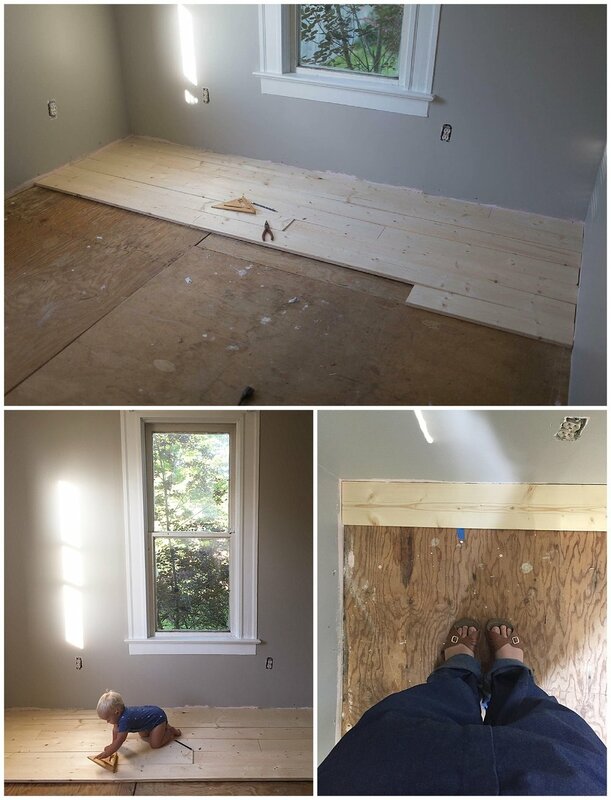 We ended up doing our floors in three sections: the bedroom, the living room, sunporch and kids’ bedroom and the kitchen. 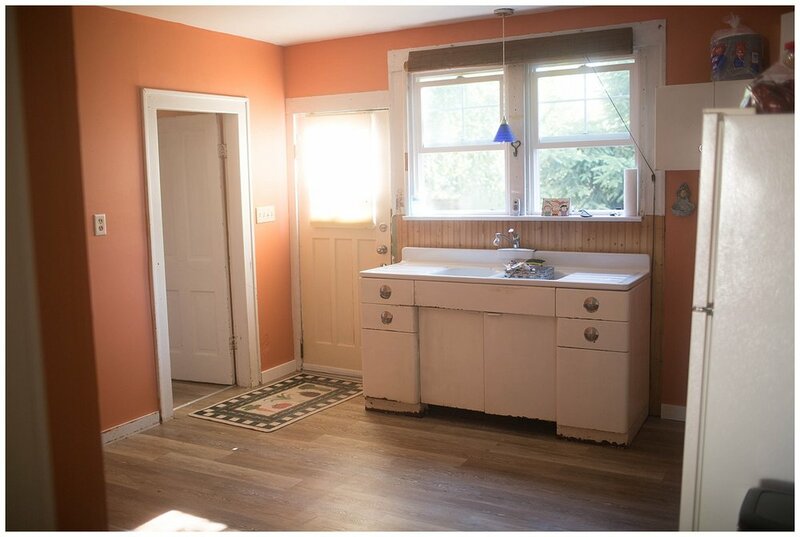 By the time we got to the kitchen, I feel like we had the perfect combination of stain/poly/sealer and if we ever did it again, I’d do it the same way. After the stain, we used a SUPER thick polyurethane. It’s thick like glue and very rewarding to use on the floors. We only did one coat of this (it’s called Triple Thick) and I can’t imagine doing more than one coat. After that dried we used a floor finisher called “Nano Defense” that’s supposed to be very good at protecting against scratches and dents. We did 3 or 4 coats of this stuff. It’s expensive (around $90/gallon) but worth it to us! This stuff is much, much thinner and was quick to apply, but we had to wait 72 hours before moving back onto the floors. 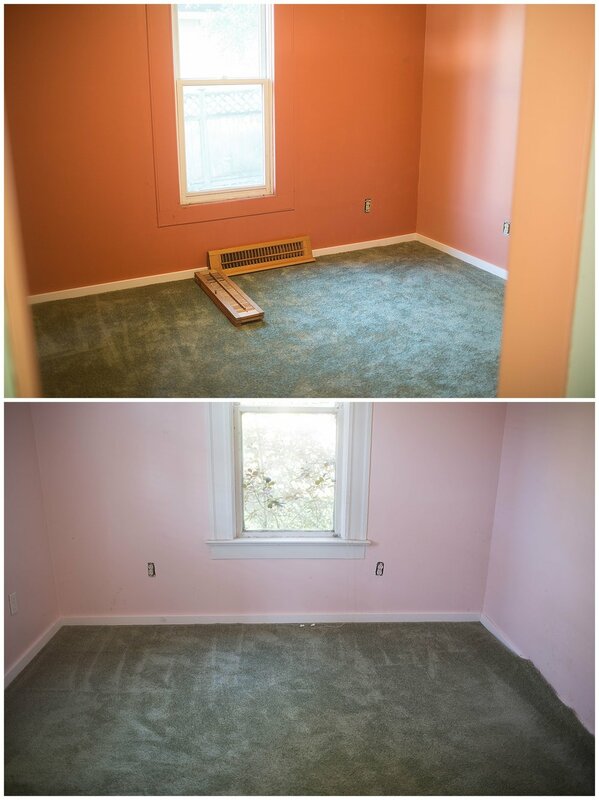 After the floors completely dried and cured, we installed baseboards and trim and moved in! We’ve been living on our DIY wood floors for 6 months now and we’re still thrilled with them! I figured out the final cost and the floor cost about $1.75/sq foot. You can certainly find cheaper, but I really like the look and character of our floors and I’m content with the price! Pine is SOFT. Our floors have scratches and dings and dents and that’s fine with us! My main goal was to end up with floors that looked like they could be original to our 125 year old home and I feel like we accomplished that! The boards will shrink and shift slightly as they cure in your home, even though we installed everything as tight as we could, we do have some gaps and cracks that weren’t there 6 months ago, but nothing substantial. I like that if a board gets really damaged, it’s not a huge deal to pry it up and replace it! Another thing that I appreciated about this project is that there was little to no waste. We could used almost every inch of every board - even tiny pieces could be used at the end of a row. We didn’t have to buy flooring by the box full or have pieces leftover! I really tried to take a good picture of the kinds of dents and dings I’m talking about in the picture on the left above, but as you can see, they’re pretty minimal! This specific spot is in a high traffic area in our living room. On the right is the area where we notice the shrinking and changes the most (I’m assuming because it’s near the stove where it’s really hot almost all the time!). You can see the biggest gap, the rest is much smaller. If that specific board bothered me, I could pry it up and lay a new one down! All in all: This was my favorite project we did in the house and I’d do it the same way again!